Guatemala is at a turning point. Historically it's been a 100% Catholic country — but that's changing — rapidly. 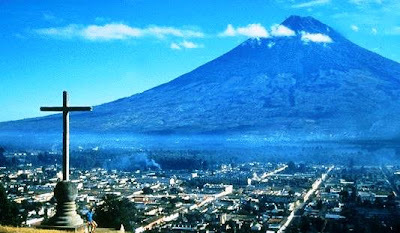 Demographers predict that early in this century Guatemala will become the first mostly-Protestant Latin American country. This story shows a different side of that trend: How two Evangelical Protestant missionaries went there to convert Catholics and discovered something amazing and life-changing. The jet made a careful descent between the three volcanoes that ring the sprawl of Guatemala City. It was April 19th, 1992. My husband, Marty, and I had reached the end of eight years of preparation to be Evangelical Protestant missionaries. We were finally here, excited and eager to settle in Guatemala. We knew our faith would be challenged and stretched, but we were more than ready for it because above all else, we desired to serve God with everything we could offer. Our new life as missionaries had just begun. I didn't feel even a twinge of regret over what we'd left behind in the States: family, friends, a familiar language and culture, and amenities like clean water and good roads we Americans so often take for granted. In spite of the unknowns ahead, I knew we were being obedient, regardless of the cost. We were living smack in the middle of God's will, and it gave us a great feeling of security. We had given ourselves fully to bringing Christ's light to the darkness of this impoverished, Catholic country. As the jet touched down onto the bumpy runway, tears welled in my eyes. "Thank you, Jesus," I whispered as I reached over to squeeze my husband's hand. Marty and I had come to the end of a long journey, but we were also beginning a new one. "Some day, Lord," I prayed silently, "I hope this foreign place will feel like home." I was elated as we walked down the exit ramp from the plane and began the long-awaited adventure of being Protestant missionaries - missionaries sent to "rescue" Catholics from the darkness of their religion's superstition and man-made traditions and bring them into the light of Protestantism. The Catholic World Report has a good piece on what writer George Neumayr calls "Cardinal O'Conner's Revenge." It thoughtfully explores the underlying reasons why the liberal candidate for president of the USCCB, Bishop Gerald Kikanis, lost yesterday's election to New York Archbishop Timothy Dolan. It's a brief but good read. Here's the best line: "The irony of Bishop Kicanas’ defeat is that the fingerprints of dissenters are on the weapon that felled him . . ."